Oscar winner Damien Chazelle reunites with his La La Land star Ryan Gosling for the dramatic film First Man. 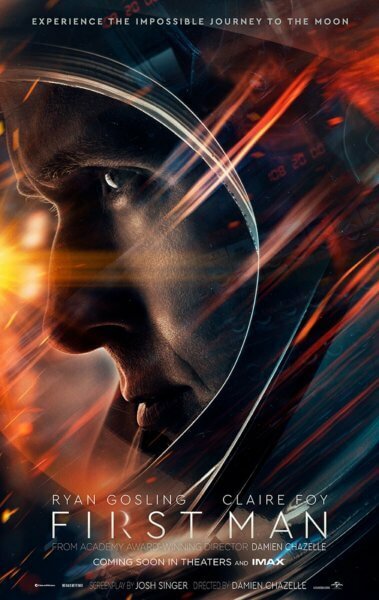 The Universal Pictures and Amblin Entertainment production just unveiled its first official poster featuring Gosling as astronaut Neil Armstrong. The studio also confirmed the first trailer will be released online tonight after Gosling appears on Jimmy Kimmel Live!. Ryan Gosling’s co-stars include Claire Foy (the upcoming The Girl in the Spider’s Web, The Crown), Jason Clarke (Dawn of the Planet of the Apes), Kyle Chandler (Manchester by the Sea), Patrick Fugit (Full Circle), and Ciaran Hinds (The Terror, Game of Thrones). Ethan Embry (Grace and Frankie), Shea Whigham (Fargo, Boardwalk Empire), Corey Stoll (The Strain), and Pablo Schreiber (American Gods, Orange is the New Black) also star in the film which chronicles astronaut Neil Armstrong’s mission to the moon. Award Award-winner Josh Singer (Spotlight) wrote the script, based on the book by James R. Hansen. Damien Chazelle, Ryan Gosling, Wyck Godfrey, and Marty Bowen produced the drama. Adam Merims and The Fault in Our Stars‘ Isaac Klausner served as executive producers. Universal Pictures hasn’t announced the premiere date, however the studio did confirm they will be releasing First Man in IMAX as well as 2D theaters. The Plot: On the heels of their six-time Academy Award-winning smash, La La Land, Oscar-winning director Damien Chazelle and star Ryan Gosling reteam for Universal Pictures’ First Man, the riveting story of NASA’s mission to land a man on the moon, focusing on Neil Armstrong and the years 1961-1969. A visceral, first-person account, based on the book by James R. Hansen, the movie will explore the sacrifices and the cost—on Armstrong and on the nation—of one of the most dangerous missions in history.